I have a slight problem with obtaining chairs. We don’t yet have more than we can use, but perhaps one more would be unnecessary. There’s an awesome antique mall in a rust belt near ghost town on the way to visiting my family. We used to live close enough to it that it would be a fun weekend day trip. We both, however, drive sedans – N’s is fairly large, so a chair or two can fit in the back seat, and mine is small and can fit one small chair, but it’s also an old beater, so we’ve had no qualms about strapping a huge old oak library table to its roof among other near impossible things. That I use as my spinning chair and re-covered in a lovely (and once expensive) vintage linen sample that came from an estate sale. But then we spotted a homely mid-century chair for the whopping price of $12.00 in the basement. The basement in parts, is a dim and dank place. Good things have come from this basement, but far better things have had to be left behind due to our vehicle limitations, or the expense of renting the van to haul it home. We sort of needed a chair for the guest room/N’s study, and I didn’t need another little chair, so we considered it. The wood seemed like it was likely walnut, but it was covered in a dark streaky stuff. There was a ghastly 1980s wedgewood blue and peach dot fabric covering the seat, but in the dim light I was able to see that there was a plaid cover underneath and thought it could be the original – possibly a wool blend in black and white and red. N set out to strip the unfortunate goop off of the wood. 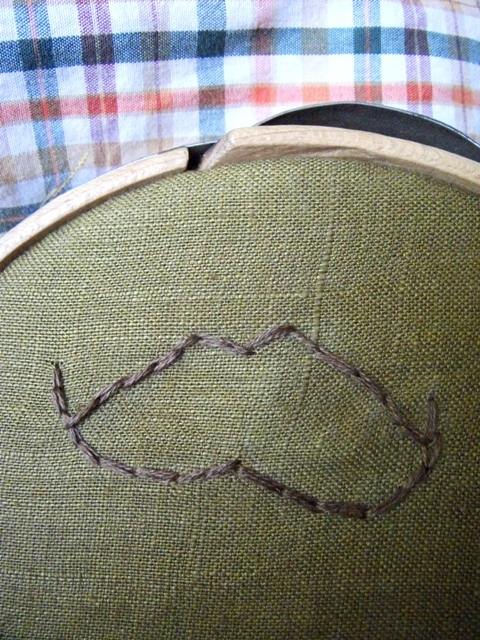 And I began to pry off the nasty insipid fabric to unveil the “original” upholstery. Only in better light, I saw that it was a nasty 1970s acrylic brown and orange and gold and barely perceptible mint green thing. And likely the top layer of dark “stain” or goop was poorly applied to the wood then too. So I pried the staples off that one and got down to the original cloth. A black and brown plaid chenille-like fabric in surprisingly good condition. But though I was pleased with finding the original seat in perfectly usable condition, it felt too dark for our house and didn’t show off the freshly restored walnut well. So I hit our town’s shop that sells used/excess art supplies and got some more upholstery/drapery samples. In the end, the one that worked best and N liked the most – a nice linen – doesn’t quite match the era of the chair, but it works well enough. I’ve also got some solid-colored but nubby-textured linen and silk blend samples that look spot-on for the time should we wish to change it or sell the chair eventually. 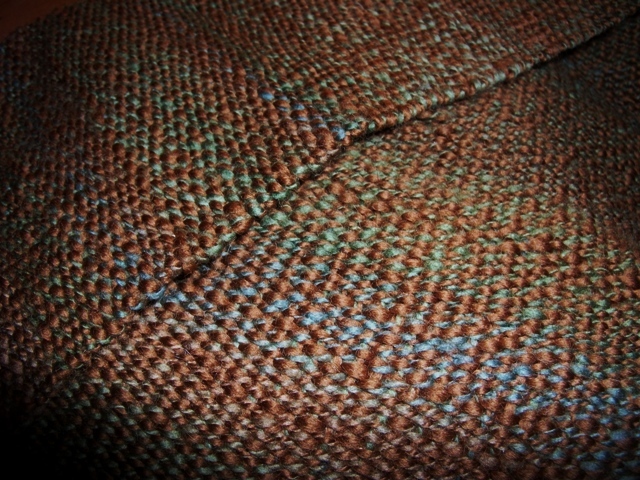 This fabric was probably meant for drapes and likely not especially hard-wearing, but it won’t be used too often and it is easy enough to change. And the original cover is still safe and sound and protected. I’ve been thinking about weaving for the last year or two… but since we moved from a good-sized house into a shithole apartment and I’m under-employed, buying a loom is very stupid on many counts at the moment – besides I don’t even know where to start with the various kinds/types/styles of looms and what I ultimately might like best. 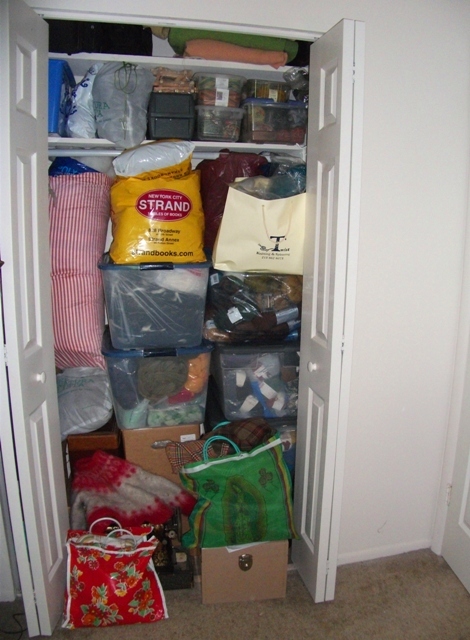 I was a very crafty child and was fortunate to have parents who encouraged it, so I would get various tools and supplies for my birthday – rug hooking kits, cross stitch stuff, beads, millions of yards of embroidery floss for friendship bracelets, and the like. 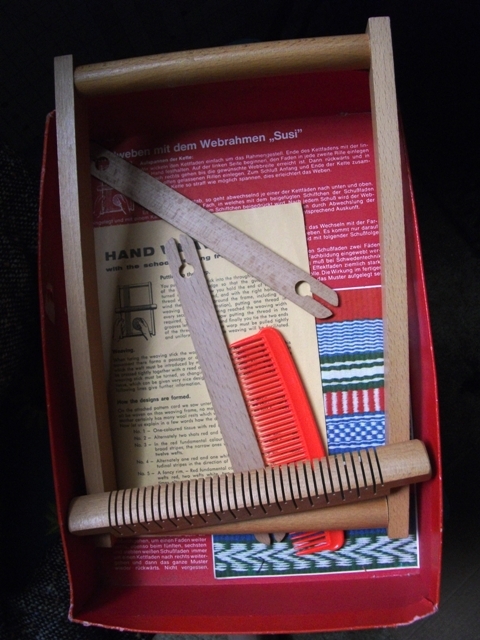 I can’t remember the details of when I got this loom – maybe the late 1970s or early ’80s? It is German or Germanic and I can’t imagine where my mom found it in the Midwest back then. Fast forward to a few months ago, and I found it in their basement where it had miraculously survived their last slash and burn move, and voila! I have a loom. So ok, it is a kiddie toy, but I’ve made a couple of smallish strips of fabric from it and they have promise to become part a larger item – I’m thinking of incorporating them into bags. And the loom has a good slot size (actual term?) 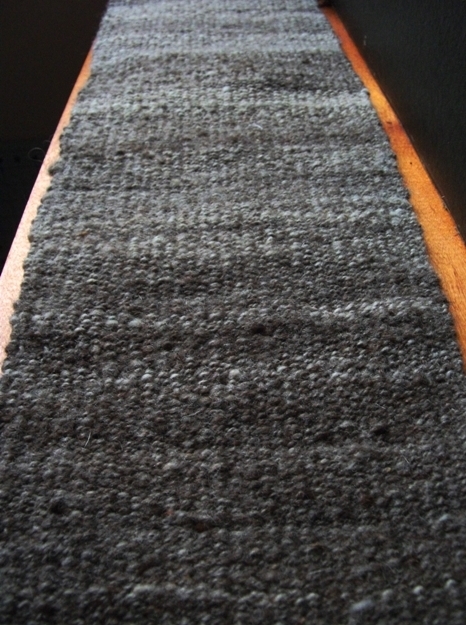 for handspun, so it’s great for using up leftovers not much good for anything else – I’m pleasantly surprised how much further yardage goes in weaving rather than knitting. 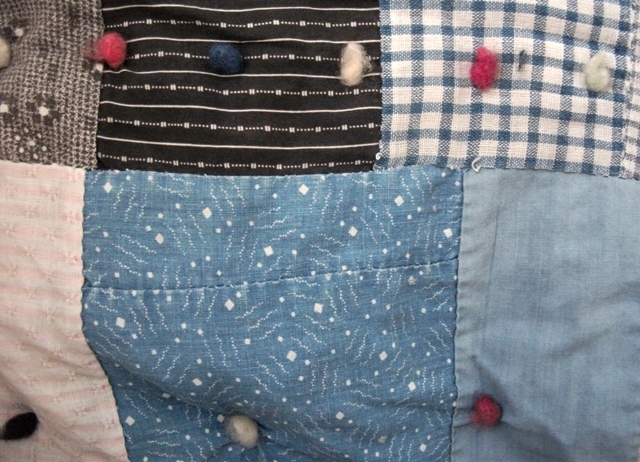 Henry’s baby quilt (toes not included). 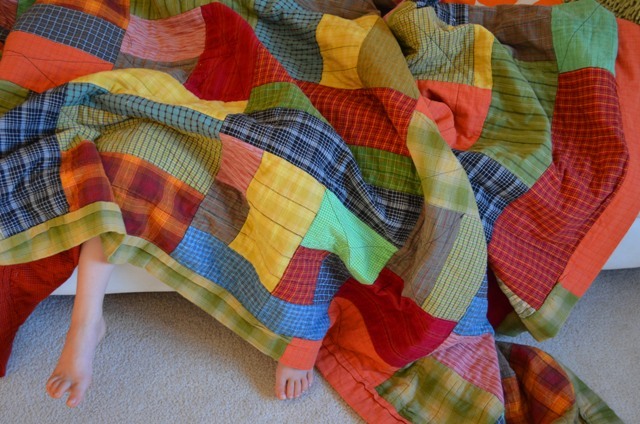 No, this is not another picture of Yasmina’s quilt, but many of the fabrics are the same, though with hers, the “blocks” were smaller. 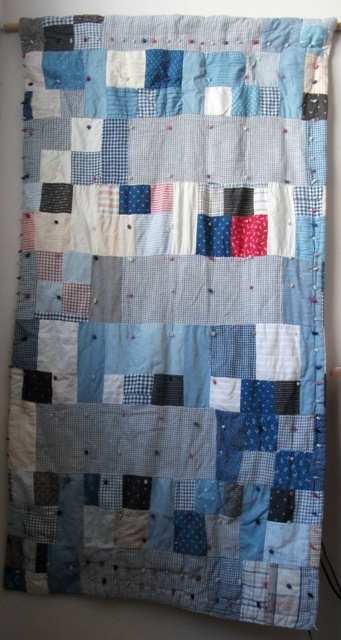 This one came a few years before that one, and was my first “crib quilt.” I remember getting the roll of pre-cut cotton batting and upon opening it, had a WTF moment when I saw how big it was… I was thinking cribs were small and babies were small, and the whole thing would be small and quick, but it was about four times the size I thought it would be. And aren’t babies not supposed to sleep with blankets anyway? But regardless, it was still smaller than a twin, so I got some more fabric and soldiered on. Much of this is from my original stash of reproduction feedsack, and my personal favorites are the blue border with the geese and the yellow pinwheely things. 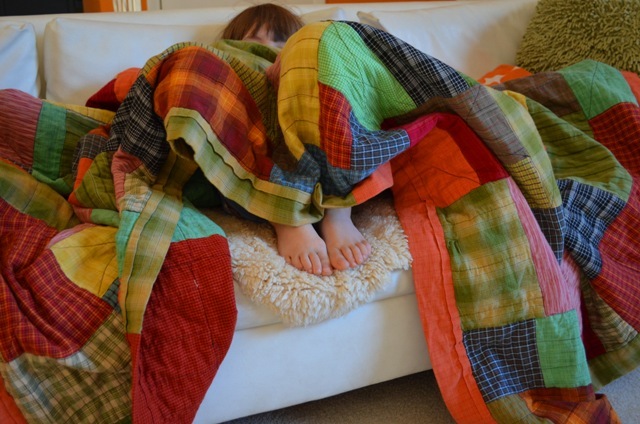 And an update of Henry’s twin-size quilt with current pictures after a few years of use. See, I thought that binding sucked – it was too wide and folded over… ah well, as I mentioned before I hate that part of the quiltmaking process. Actually, I sorta like hand-sewing the back part on when done in a different way [insert proper term here] but this was an act of speed and I sewed both sides through like a sandwich [insert another appropriate term here]. 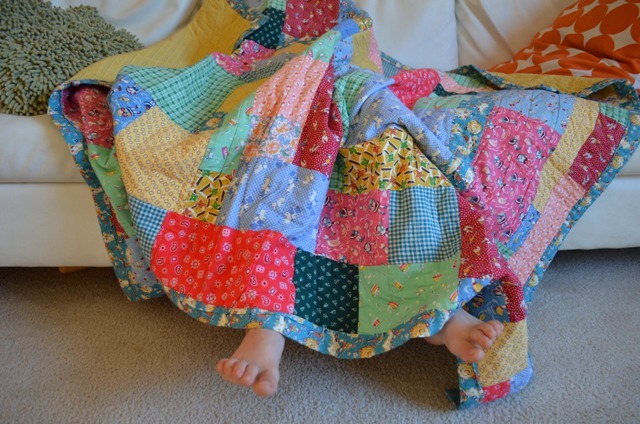 If you haven’t noticed already, I’m a self-taught quilter, and I am a bad teacher who hasn’t assigned much book learnin’ except for looking at pictures. 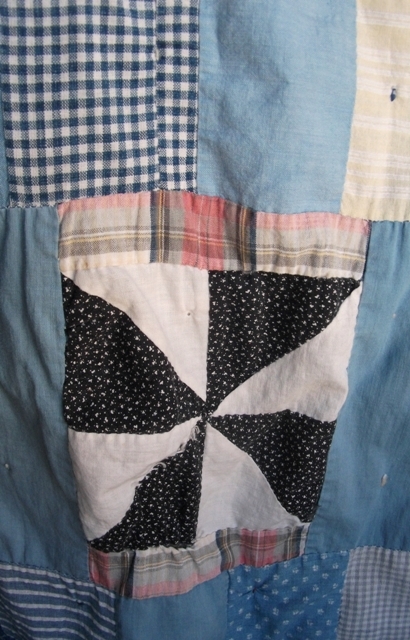 Lots and lots of pretty pictures of quilts from way back when… I hesitate to delve deeper into the actual mechanics of the thing because I tend to either loose interest or become completely obsessed when faced with loads of new knowledge. Knitting took over my life after I forcibly removed myself from only the garter stitch, and hence a monster was born. 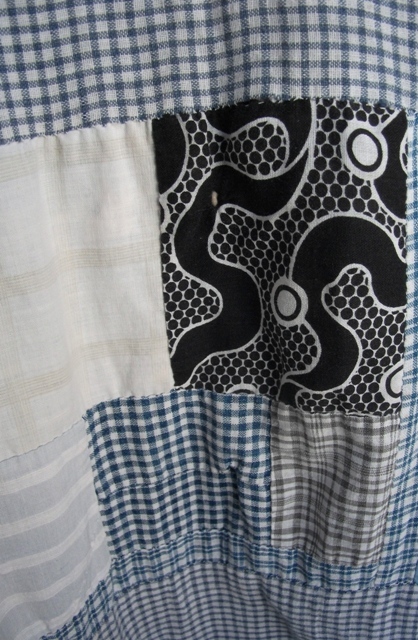 I want to keep quilting a bit more in check I suppose, but I do need some more skills in the binding department – mitered corners perhaps? 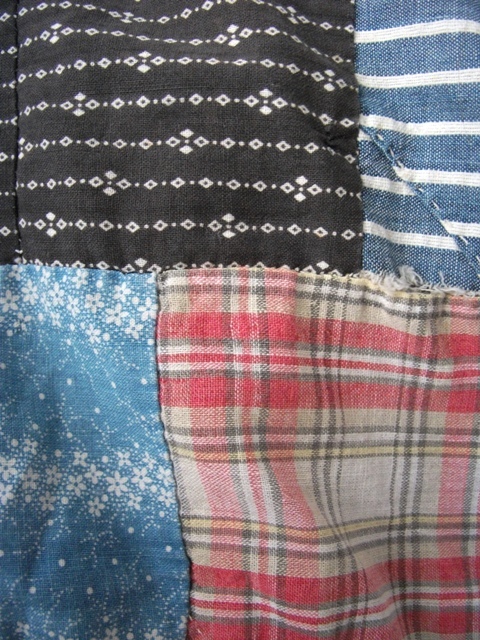 But I also do have limitations on what my vintage sewing machines can do – none of that long-arm freestylin,’ freewheeling, happy-go-lucky, devil-may-care quilting for me, though I’d like to…. Thanks to my sister-in-law for sending the pics and Charlie for modeling!